It’s entirely possible—and would have been merciful—if you briefly blacked out under the strain of constant Trump scandals unearthed during his presidential campaign, and missed this one. If so, it’s worth rectifying that: Few scandals so better display our president’s venality, his poor business acumen, and his downright weirdness, as the saga of the Tebow gear. 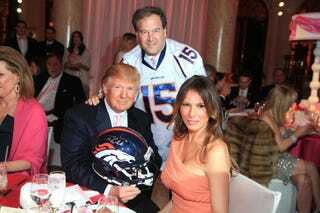 As unearthed in David Fahrenthold’s Pulitzer-winning series of reporting on the scam that is the Trump Foundation, it was revealed that in 2012, Donald Trump won a charity auction for a signed Tim Tebow helmet and jersey. He paid $12,000 for the gear; the check was written out not by Donald Trump himself, but by his own ostensibly charitable organization. The lawsuit will continue, but as part of the settlement, the Trump Foundation must dissolve, and distribute its assets to actual charities. That means selling off anything it bought with misused funds, including the Tebow memorabilia. In fact, Trump did so much self-dealing through his foundation that the assets are being sold off in lots of multiple items. Which leads us to the perfect little coda for this story on President Deals: Trump purchased the Tebow gear on the very same day that Tebow and the Broncos got walloped by the Patriots in the playoffs; the functional end of Tebowmania. The Tebow gear is combined in a lot with two large portraits of Trump—which he also bought with charity money. Together, the foundation spent $42,000 on them. According to the foundation’s most recent tax filings, the items now have a combined value of $975.